Manik Bhide was born in Kolhapur, in 1935, into a family of discerning listeners and music lovers. Her father S. R. Potnis initiated her into learning music after recognizing her liking towards the art. Maniktai’s musical training began at the age of 15, under the guidance of Madhukarrao (Nana) Sadolikar, a disciple of his elder brother Wamanrao Sadolikar, and Bhurji Khan (the youngest son of Alladiya Khan). Thus she received a strong foundation in the Jaipur-Atrauli gharana. She then learnt from Manik Varma, the veteran Kirana and Agra gharana vocalist, in Pune for a few months. When she moved to Mumbai after her marriage, she decided to learn from Mogubai Kurdikar. When she called upon her, Mogubai wasn’t home and it was her daughter, Kishoritai, whom she first encountered. Kishoritai interviewed Maniktai, and recognizing her natural endowments gave her the rare privilege of earning her discipleship. Maniktai thus remained Kishori Amonkar’s shishya for a period of nearly 16 years (1963-1980) in which she deeply studied Kishoritai’s gayaki and grasped the crux of raag-sangeet. She also travelled extensively with Kishoritai, providing vocal support in all her live concerts and radio performances. Endowed with a rich and mellifluous voice, Maniktai’s style shows fluidity and strong adherence to raagdaari, whilst maintaining a rich sense of aesthetics and a highly emotive quality. The influence of Kishoritai can be clearly detected in the lilting feel that her gayaki creates. 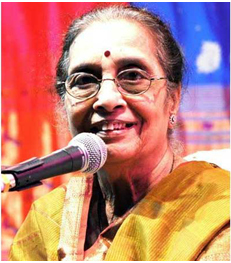 Maniktai is also well-known as a composer, having set many Abhangs to tune, many of which have been recorded and released by her daughter and disciple, Dr. Ashwini Bhide-Deshpande. Though she did not have a full-fledged solo performing career, she has had an extremely busy career as a disciple of the legendary Kishori Amonkar, having extensively travelled with and accompanying her in almost all her performances between 1963 and 1980. However, she did sing regularly for AIR and cut a few recordings (‘The Sanctity of Parampara’, 1987, by Rhythm House Classics, Ragas Nayaki Kanada, Bihag). She has also given performances in prestigious conferences like the Alladiya Khan Sangeet Samaroh. Now, she has an extremely busy career as one of the most respected Gurus. She continues to teach to this day. Her career as a Guru began after she started teaching her own daughter, Dr. Ashwini Bhide-Deshpande, and she found in it her calling. Since then, Maniktai has been committed to cultivating a strong generation of artistes. She has been putting tireless efforts into giving taleem to her students and continues to do so, to this day. Her sensitivity as a teacher is proved by the fact that she tries to gauge the precise quality of a student’s unique talent in order to help her build on her strengths and circumvent her weaknesses. She believes that the survival of the legacy is greater than the personal satisfaction derived from imparting this precious wisdom and knowledge. She has over 65 disciples, some of whom are Ashwini Bhide-Deshpande, Jyoti Kale, Geetika Varde-Qureshi, Vandana Katti, Sveta Kilpady, Apoorva Gokhale, Meenal Bhide, Sampada Vipat, Maya Dharmadhikari, Sonal Shivkumar, Sumedha Desai, Nishad Matange, amongst many others. She was conferred the Manik Varma Smruti Puraskar by the Manik Varma Pratishthan in 2004. For her tireless and silent contribution to the field of Hindustani raag-sangeet, the Maharashtra government bestowed its highest award in the category of performing arts on her – the Bharatratna Pt. Bhimsen Joshi Award, for the year 2017-18.